After activation, SCP-521 is to be retrieved from its new location and placed back in storage. SCP-521-1 onwards are to be held in Archive 4 of Site-39, with digital copies made available on the Foundation intranet. Access to these documents is not restricted (SCP-521-27 is an exception, see below). SCP-521-X are to denoted numerically and stored per procedures above when retrieved. 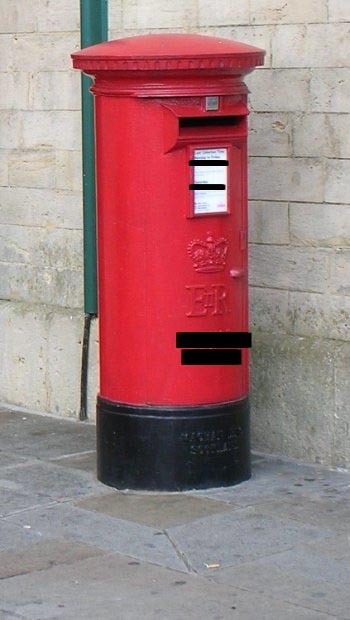 Once a suitable letter has been posted and delivered, SCP-521 will disappear from its current position, and reappear elsewhere inside a urban location within 150km. Its current method of movement is unknown; however, any obstruction to the letter slot is removed during transit. No other parts of SCP-521 are affected during its transit. Any mail items posted between activation and delivery will be processed normally. After SCP-521 has completed a transition to another area, its effect will activate on the next suitable piece of mail. The letter is written on the reverse of a Kellogs 'Coco Pops' brand cereal box. The partial expiry date present gives an estimated production date of January 21██. The date of the letter's writing is currently unknown. Special Containment Procedures: SCP-## specimens are to be housed in suitable terraria at Bioresearch Site 4. Enclosures should contain a minimum of twenty (20) centimetres of soil, with a variety of branches and foliage. Habitat materials should be sourced from plant species resident to the United Kingdom, see Document SCP-##-H for more information. Enclosures should be misted with water at regular intervals of between six (6) to ten (10) hours. Personnel handling SCP-## should wear full body protection, however no particular hazard protection is required beyond regulation handling procedures. In case of contact, attempt to dislodge SCP-## as soon as possible. Wild instances of SCP-## are to be captured if possible. However, due to major adverse effects of SCP-## requiring prolonged exposure, containment of individual specimens is not a high priority. All SCP-## nests outside of Bioresearch Site 4 are to be incinerated on discovery. 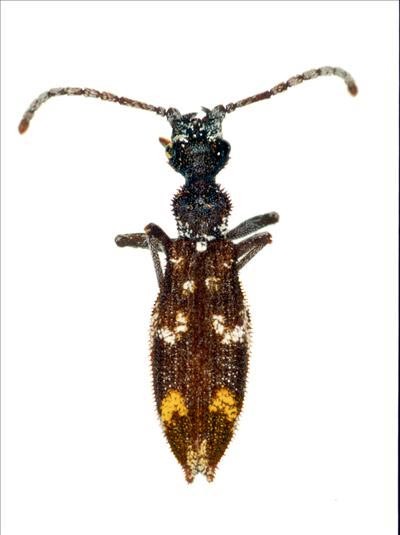 Description: SCP-## is a species of beetle superficially resembling the Australian species Omma rutherfordi, approximately thirty (30) millimetres long. Recovered from several sites around the United Kingdom, SCP-## has minor differences from Omma ruthfordi at the cellular level, due to inclusion of [DATA EXPUNGED] on the tarsus. All other traits are similar to the Australian species, including reproduction, life span and nesting requirements. A notable exception is a slight yellowing of the lower band on the abdomen of SCP-##, this should be utilised during identification. Upon alighting on any animal (non-members of Animalia are not affected), SCP-## causes a reaction in the subject's nervous system. Interviews with affected subjects describe the reaction as further specimens of SCP-## alighting upon their body. The number of reported SCP-## in contact with the subject increase in a linear fashion while SCP-## is in contact with the skin or fur of the subject. Multiple instances of SCP-## coming in contact with a subject compound the effect, causing effects to increase exponentially. See Addendum ##-A1 for information regarding exposure. While not lasting indefinitely, the effect persists for a period of time proportional to direct exposure after contact is severed. Due to the small size of SCP-##, exposure times in natural cases often have short durations, at little detriment to the subject. The reason SCP-## causes this reaction is not currently understood, however current hypothesis suggests it is used as a defence mechanism; by creating an overwhelming sensation on the skin of the subject, SCP-## is able to either move away from an attacker or cause the attacker to move away themself. Addendum ##-A1: Multiple tests have confirmed that contact with SCP-## for less than three (3) minutes has no long term effect on a subject. However in all cases exceeding this limit, subjects are noted to suffer formication1 at apparently random intervals. This limit has been created utilising contact of a single instance of SCP-##. 1. Tactile hallucination similar to insects crawling on the skin.